Before committing to a large renovation like a sunroom or other addition, you need to know that your investment will be protected. After all, you don’t want to be saddled with ongoing major expenses due to a poor installation or underperforming structure. 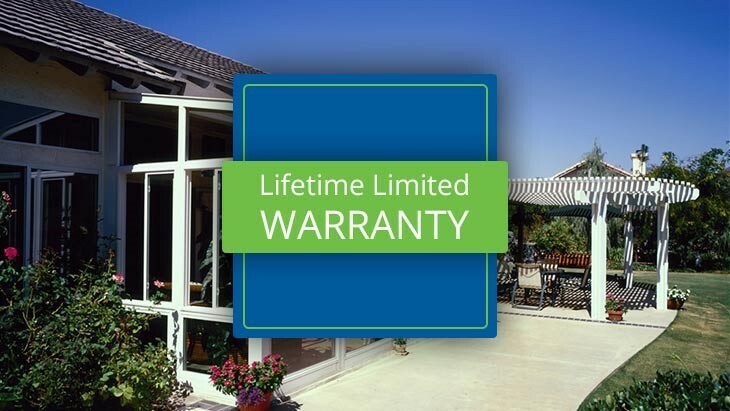 At C-Thru Sunrooms, we give you the peace of mind you deserve through our Lifetime Limited Material Warranty—the absolute best sunroom warranty on the market today! Lifetime Term: Our Warranty guarantees that painted aluminum parts will never peel, blister, rust, or crack, and that vinyl thermal cladding, hardware, and weatherstripping will never fail. All glass panels are also warranted against breakage—for life! Transferable: Adding to the value of your remodeling investment, our sunroom warranties are transferable to new owners should you decide to sell your home. Additional Coverage: Our insulated glass is warranted against seal failure for 20 years, and our laminated roof and wall panels are warranted against delamination for 15 years. If you experience any issue with these components, all you have to do is let us know! Incidental Glass Breakage: C-Thru's exclusive DuraLife is so strong that it is warranted against incidental glass breakage for the lifetime of the product. With C-Thru Sunrooms, your new sunroom addition will be warranted for life, as long as you own it. Request more information about our strong warranty protections by getting in touch with us today! If you’re ready to take the first step toward designing your beautiful new sunroom, use our online form to sign up for a free in-home consultation and cost estimate from your local authorized dealer.